Officiant for secular, Jewish, interfaith, Irish handfasting weddings; LGBT couples have always been welcome! Was Rome really the foundation of “traditional” Judaism? 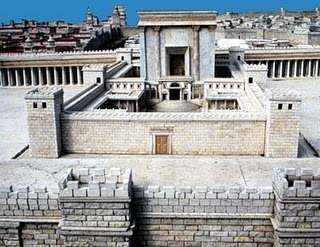 A model of the Second Temple, destroyed by Rome in 70 CE. Imagine if what we had been taught in religious school is that many of the fundamental elements we consider “Jewish” are actually attributable to the Romans. How would that affect what we call “traditional Judaism”? How would that shape our thinking of what defines Reform Judaism versus Orthodox or “traditional” Judaism? What elements am I referring to? Well, ones like separating meat and dairy as a core element of kashrut. That practice doesn’t come from the Torah. The Torah only lists certain foods as being prohibited (like pork and shellfish) – it says nothing about not mixing meat and dairy. That notion evolved centuries later, out of the rabbinic tradition. Or how about the Passover seder? That also came about in the rabbinic era, after the fall of the Second Temple in 70 CE, as a replacement for the animal sacrifices that used to be conducted at the Temple each Pesach. 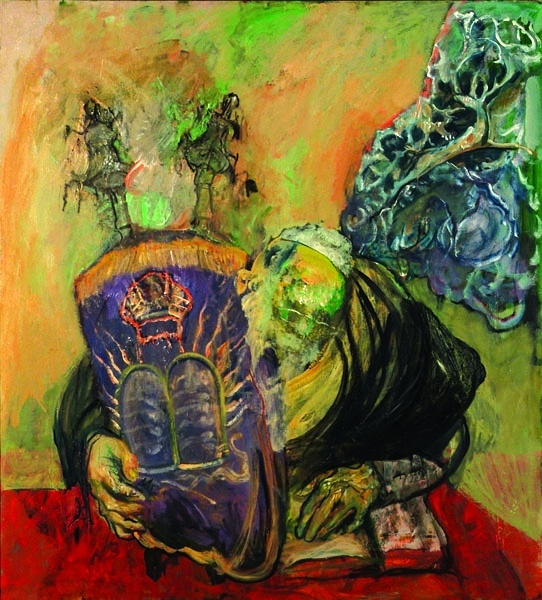 Or how about the reams and reams of halacha, Jewish law, that govern everything in “traditional” Jewish life today like which days or weeks a couple cannot get married; what violates the biblical rule to not “start a fire” on Shabbat (light switches, ovens, car engines, telephones); how many days a mourner should sit shiva and when shiva is suspended, and from whom a person should sit shiva; etc. etc. etc. All of it comes from rabbinic Judaism (and, later, medieval Judaism). And rabbinic Judaism owes its very existence, its very ascension to the forefront of Jewish life, to the Romans. In my Rabbinic Civilizations course, one of our assigned books is From the Maccabees to the Mishnah by Shaye J.D. Cohen, which is a concise and fascinating history spanning from the end of the Persian exile to the 4th century CE. The rabbinic era spans the latter part of that time period: from the fall of the Second Temple in 70 CE through the writing of the Mishnah and Talmud in the 6th century CE (500s). As Cohen writes in chapter 7, the shift from Second Temple Judaism to rabbinic Judaism was not a mere chronological transition but a substantial change that laid foundational cornerstones still central to the Judaism practiced in our contemporary world. As Martin Jaffee explains in his equally excellent book, Early Judaism, the Romans continued to control Judea long after the Temple fell. Their method of control was simple: Appoint Jewish institutions to administer over the daily affairs of their people, and allow the Jews to preserve their ancestral customs so long as they don’t lead to unrest or violate Roman law. Rome named a Jewish appointee to be the “Patriarch” of the country – and this Patriarchate system lasted for more than 400 years. Although a second revolt by the Jews, the Bar Kohkba revolt, in 132-135 CE, represented an interruption of this policy, the interruption was brief. Once quelled, Rome simple renamed Judea “Palestine” (to name the land after the Philistines rather than the Jews), and re-instituted the Patriarchate. Who was the Patriarchate? It was what would become known as “the Rabbis.” Its first holder, in 90 CE, was the rabbinic master Gamaliel b. Shimon b. Gamaliel and the office remained strictly hereditary for the next 400 years. Why did Rome chose a rabbinic family? We don’t know. Why was Gamaliel chosen from among the possible rabbinic families? We don’t know that either. What we do know is the net effect of that policy: Slowly, over the course of hundreds of years, the beliefs and practices that represented a small, minority proportion of the Jewish people (the rabbinic class) increasingly dominated all sectors of Judaism and Jewish society, even those far out into the diaspora, until eventually, it became “normative.” What had been, in the time of the Temple, a minority group whose views were opposed by most segments of Jewish society [the wealthy, the priesthood, and the bulk of the masses (am ha’aretz) in both Israel and the diaspora], ultimately triumphed over their opponents and became the mainstream. The rabbis didn’t invent the synagogues so much as take them over and use them as a means of advocating their own particular interpretation of Jewish law and practice. It took well over half a millennium for that to happen, and it could only happen because the ruling power of Rome established, sanctioned and supported their power. How ironic, then, that these rabbinic views and opinions are what we all today, even we liberal Jews, identify as “traditional Judaism”! I am a writer, editor, wedding officiant, mother and scuba diver. I wrote a narrative nonfiction book about my two decades of dating called Chasing Cupid: Tales of Dating Disaster in Jewish Suburbia. Now I love to spend my time crafting wedding ceremonies and writing about life, love, and all things Jewish.